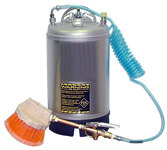 These high quality stainless steel tank sprayers remove the need to replace low-quality plastic trigger sprayers and throw away plastic pump sprayers. 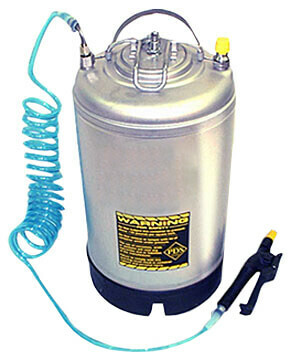 Filled tanks can be easily pressurized using a tire air chuck with up to 125 PSI . 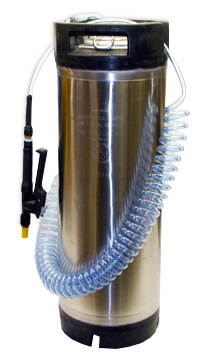 Tanks come with a chemical resistant polyurethane coiled hose, viton sealed polypropylene spray gun with drop in strainer and adjustable pattern nozzle. A new option includes the new Dress Pro flow through chemical applicator brush, fixed pattern nozzle (40° flat fan, won’t break), 22" extension wand for easy reaching and spot spraying and a foaming nozzle for applying shampoos or soaps. Tanks can easily be filled through a wide oval opening lid designed with a built in pressure relief valve. Ease of use, no waste and long life saves you time and money. Applying degreasers, pre soaks, lubricants, bug removers, whitewall cleaners, non acid wheel cleaners, tire dressings, window cleaner, shampoos, vinyl and rubber dressings, weed killer, fabric protectants, disinfectants, spot removers, carpet cleaners and deck stain etc. This line of stainless steel tank sprayers and flow through applicator brushes are versatile for your chemical application needs. These sprayers are the answer to replacing, once and for all, the cheap plastic trigger and pump up sprayers that have frustrated you for years. For Degreasers, Bug Cleaners, Vinyl Dressing, Weed Spray and More. Warning: These tanks are made of 304 stainless steel, and are not meant for use with acids, corrosives or high oxidizers. Maximum operating pressure is 90 to 125 PSI. All units are tested to hold a minimum of 90 PSI. This stainless steel tank sprayer with tire dressing applicator sprays evenly and efficiently with less waste. Warning: This tank is made of 304 stainless steel, and not meant for use with acids, corrosives or high oxidizers. Maximum operating pressure is 90 to 125 PSI. All units are tested to hold a miniThis stainless steel tank sprayer with tire dressing applicator sprays evenly and efficiently with less waste.mum of 90 PSI. If you are tired of continually having to pump your chemical sprayer while hauling it around on your back, this sprayer application kit is for you! Our chemical sprayer uses compressed air to spray a wide variety of chemicals and is mounted on a cart for easy application. Comes equipped with 25’ of hose, spray gun and lance. Ideal to use in car wash, industrial and commercial cleaning application. Algicides, Animal Repellents, Anti-Microbials, Bird Control Chemicals, Fertilizers, Garden Sprays, Herbicides, Insect Repellents, Misting Plants, Pesticides, Plant Food, Tree Paints, Water, Weed Killers, Wood Preservatives, Wood Sealers, Wood Stains. Available Pro-Chemical sprayers, Pro-Chlorine sprayers, electric, and disinfecting chemical sprayers.